Years ago I purchased a vinyl 1/6 stormtrooper model kit on ebay. Well, the darned thing was top-heavy and I could never get it to stand up. Eventually, I used the legs to make custom shin armor for the custom 1/6 scale Mara Jade figure I made for my wife. 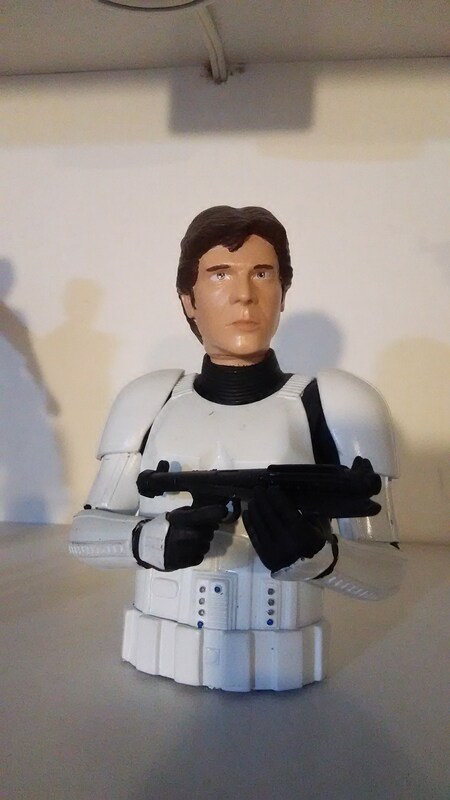 So, I was left with a 1/6 scale stormtrooper torso, and this head sculpt that came with it – which resembles Han. 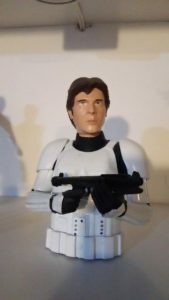 So, I painted up the head sculpt (one of my first attempts), and made a Han mini-bust out of it.